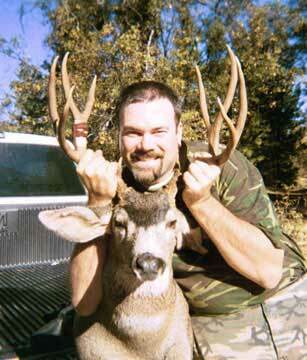 John Bright shows off his fine 4x4 buck. I took this beautiful blacktail/muley hybrid this year in California's combined D3-D4 zone. It was on the last weekend of a hard-hunted season. The weather played a big part in making the herds finally start heading down in the last week of the season, so that's where I thought I'd try my luck. After hiking out in the morning darkness, I was standing like a statue in full camo for nearly a half-hour, scoping out a clearing in hopes of catching something heading to bed down, when the buck ambushed me! I was only about 40 yards from the buck when I saw him come trotting down a trail through the oaks right at me! I slowly and cautiously pivoted toward him, trying not to spook him as I raised my 30.06. 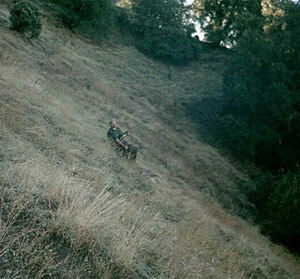 He still hadn't noticed me and was still coming down the trail toward me. This beautiful buck never saw or heard me until I clicked my safety off, sending him into full alert. Needless to say, that was the last thing that he heard! It took me and my brother, Gary, a couple of exhausting hours to get him up and out of the steep canyon that he was in (see picture below). But that seems to be where the nice bucks go these days  where no one else will! It is certainly all worth it now though, as his head and cape are frozen and awaiting the taxidermist and the jerky is in the smoker as we speak! John Bright poses at the site where he took his buck.